Powerful and sophisticated field services tools have changed the way the service industry measures key performance indicators critical for success. If your service organization is trying to make decisions based on traditional metrics and guess work, it’s time to change to an analytics-based, predictive model so you can make better-informed, data driven decisions. How these tools have changed the face of field services metrics is directly tied to the ability to capture the “heartbeats” and characteristics of every task. Depending on the specific implementation of a field services solution, it’s now possible to capture discrete heartbeats that timestamp when a task is; dispatched, assigned, on route, on site and completed. In some industries, in more sophisticated implementations, it’s possible to further capture heartbeats around movement and distribution of material and to capture heartbeats from test systems which can be used to predict approximate time of resolution which greatly helps with optimization and distribution of work. With these technology enabled data points it is now possible to consider adding travel time, utilization, and non-productive or idle time. Travel time is the time between going on route and arriving on site, Utilization is the time between on site and complete and non-productive time is the calculation of shift length – (travel time + utilized time). So why is all this important? Let’s look at unionized employees from a productivity and utilization standpoint. With unionized employees, you are paying for them regardless of how effectively they are being used. In this model, to get the greatest benefit for the cost of running your business, it’s necessary to ensure that you are getting the most out every minute of your employees’ days. The level of detail that the field services tools capture today allow you to get a much more granular feel for the variables that are affecting your business. This allows you to understand your current allocations by category, track trends and put in place processes to improve those areas that are driving a negative effect on your bottom line. It is however, important that you consider all the data when making your improvement initiative decisions. 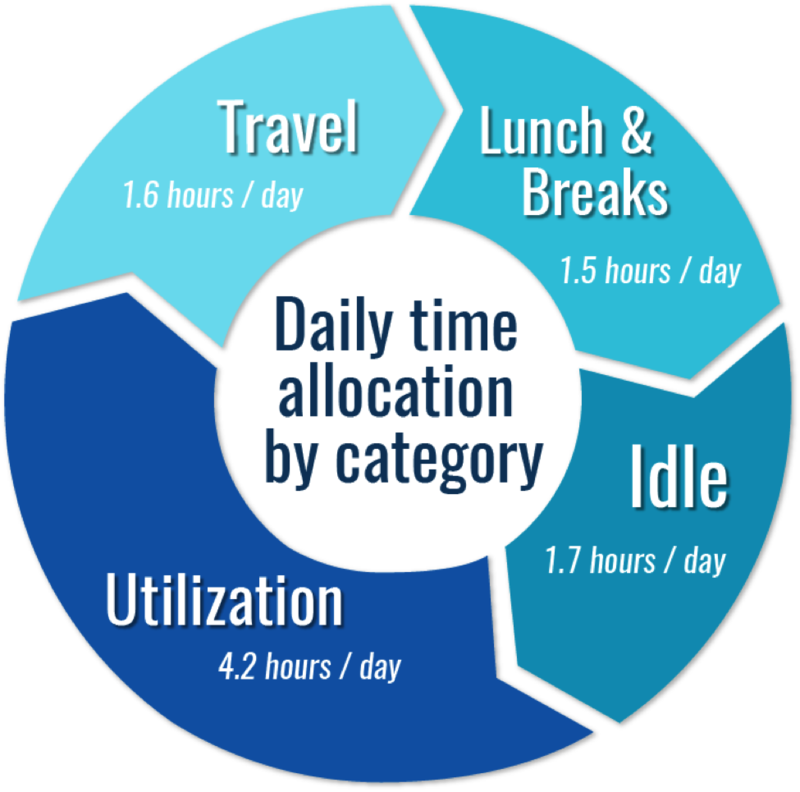 In the first graphic, you will see a chart depicting an allocation of time by category for a typical day in the services business. The data elements not shown here are that the productivity metric for this day was 4.68 and the shift length was 9 hours. It’s not unusual to see that actual working time or utilization is around 50% of a normal day. Having data like this allows you to hone in on specific aspects of where your technician spends their time to drive improvement. In the next graphic, you can see the rest of the numbers based on the data from the first chart. Again, you need all the data to make an informed choice about where you decide to focus your efforts, otherwise the results could be unexpected. Each of these metrics is a lever and pulling any one lever will affect the others. The first instinct when looking at this will be to increase utilization and reduce idle time. This is always a good goal since idle time is clearly unproductive, however, you need to ensure that you hold or improve the avg mins/task metric at the same time. Otherwise, you could accomplish your goal of increasing utilization and reducing idle time yet productivity could remain the same and no additional work is being done. Increasing productivity is always a preferred outcome unless you are trying to solve for a significant quality issue. 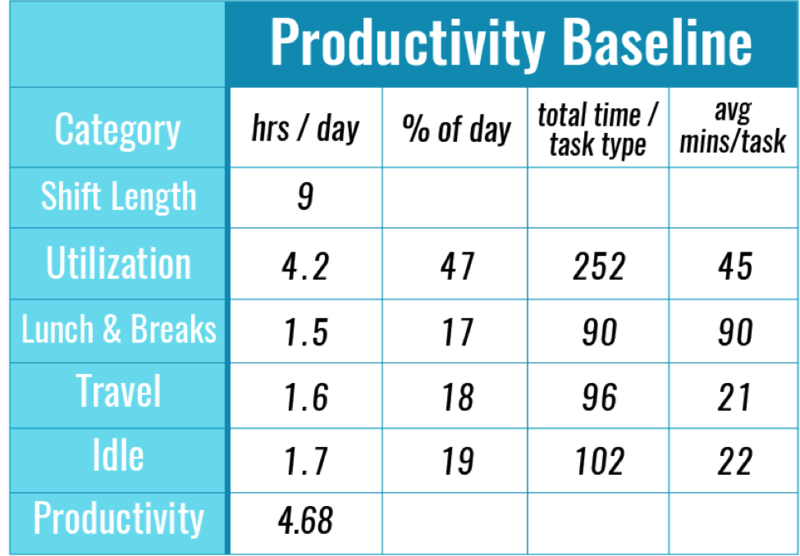 In the above example one could envision a goal as follows: increase productivity by 7% to 5 jobs per day by holding avg mins/task at 45 minutes and reducing idle time. The math looks good; all you must do is find the technician an additional 15 minutes. To achieve anything over 5.0 jobs per day the levers are shifting and to move the average up even a .1 will require more travel time, this means that the 15 minutes you were looking for could mean a requirement for as much as 36 minutes. When focusing on reducing any metric, take a good look at all aspects of the inside and outside job. It’s easy to say that the technician just needs to work harder or smarter but generally there’s much more to consider. Poor processes around managing changes to a day’s schedule, like job cancellations or client not available, often drive situations where the technician is waiting on work. Hiring field services consultants to conduct an operations review is a good alternative and ride along exercises both inside and out can help determine where the real problems are. 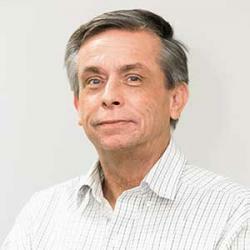 Dave Wilder is the president of Gogh Solutions. With a long history in enterprise IT and field service operations, Dave is a senior leader who specializes in delivering high-caliber IT program and project delivery services. Dave's expertise assists his clients in effectively utilizing technology to realize their strategic business objectives. Dave is a highly valued, trusted advisor to numerous corporations. His expertise in business transformation has helped many clients build and maintain a more efficient services business model and improve operational processes. Dave holds multiple certifications in leadership and change management and has held various senior roles with Bell Canada. Throughout his career, Dave has demonstrated success in several key areas, including developing business growth, improving profitability and driving strong results with extended teams.